From hail storms and high winds to fog and heavy rain, each season brings its’ own unique challenges to the transportation industry. Though fleets and professional drivers are trained and well-prepared for all sorts of extreme weather, an unprecedented weather pattern or an unusually strong storm can test even the most experienced and prepared professional. Hurricane season 2018 was exceptionally challenging for many fleets as two record-breaking storms hit back-to-back. Relentless rain and wide-spread flooding in the southeast left many of the area’s major roads and highways underwater. Stretches of 1-40, I-95 and US Route 70 were impassable for days and flood waters left many vehicles stranded either partially or fully submerged in water. Hurricane Florence, making landfall Sept 2018, was the wettest tropical cyclone ever reported in North Carolina and the eighth-wettest overall in the contiguous United States. From September 13th to the 15th, heavy rain continued drenching the Carolinas as the storm refused to leave the area. Just a few weeks later, Hurricane Michael hit the Florida Panhandle as the strongest storm to make landfall in the continental US since 1992. It was also the first Category 4 storm to ever hit the area. The storms challenged many fleets by leaving a wake of damaged vehicles behind, seemingly overnight. Water damage was prevalent, and even after the rain moved out, storm surges and overflowing rivers continued to compound the issue. Once a tractor trailer has been submerged in water, certain components, such as the wheel-ends, can begin to corrode. Exposure to salt water, because of its’ corrosive nature, is even worse. Water can cause wheel ends to corrode – degrading lubricants and metal components. Salt water, because of its’ corrosive nature, is even worse. Faced with a number of units now out of service, fleets had to react quickly to begin the process of accessing and repairing the damage. Even if damage is not immediately evident, inspecting and restoring a water-damaged unit before placing it back into service is critically important and can help avoid a possible catastrophic failure in the future. Learn more about the proper procedures and guidelines for restoring submerged tractor and trailer wheel ends in this free downloadable guide from Timken. Download this free 4-page pdf, “Restoration Guidelines for Submerged Tractor and Trailer Wheel Ends” to learn more about inspecting and safely restoring a water-damaged unit. Ryder Fleet Products is the aftermarket parts online business of Ryder Systems, Inc. – a Fortune 500 commercial transportation, logistics and supply chain management solutions company. With over 80 years of experience maintaining the most reliable fleet in America, Ryder understands the unique challenges inherent in the transportation industry. Learn more at www.RyderFleetProducts.com and explore our selection of over 60,000 medium and heavy-duty aftermarket truck parts from the industry’s most respected and reliable brands. Stay up-to-date and in-the-know with the Ryder Fleet Products e-newsletter. RoadCheck is an annual event sponsored by the Commercial Vehicle Safety Alliance (CVSA), North America’s leading commercial vehicle enforcement organization. During June 6-8, 2017, 13,000 CVSA and FMCSA inspectors conduct roadside inspections at more than 1,500 locations. The goal of this event is to increase safety and security on the highways and reduce the number of crashes involving commercial vehicles. Each year, International RoadCheck places special emphasis on a category of violations. This year’s focus is cargo securement. While checking for compliance with safe cargo securement regulations is always part of roadside inspections, CVSA is highlighting cargo securement safety this year as a reminder of its importance to highway safety. All commercial motor vehicles (trucks, buses, and motorcoaches), plus all CMV drivers of those vehicles, could be subject to a roadside inspection. Why is Compliance So Critical? Last year, during Roadcheck 2016, 17.8% of all the vehicles inspected were placed out of service. Are your vehicles inspection-ready? And your drivers, too? If not, either or both could be placed out of service. And that can lead to a multitude of negative consequences, including delayed shipments, lost revenue, a tarnished company image, loss of customers, DOT penalties, and a hit to your CSA BASIC scores. That’s just a sampling of 2016’s results. Are your vehicles and drivers inspection-ready? Below are our top picks from industry safety expert J.J. Keller for educating and training your drivers to help you protect your safety reputation, CSA BASIC scores, and bottom line. 1. Tractor Trailer Vehicle Inspections Video Book Use this on-the-go, portable video training book to prepare drivers of property-carrying commercial motor vehicles for conducting pre-trip, on-the-road and post-trip inspections on standard CMVs. Drivers will also learn when a Driver Vehicle Inspection Report (DVIR) is required, and how to accurately complete one. 2. Semi Trailer Inspection Procedure Poster: A handy walk-around sequence poster with at-a-glance easy-to-understand instructions. 3. 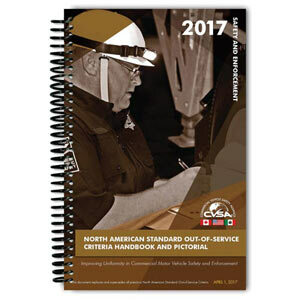 2017 North American Standard Out-of-Service Criteria Handbook and Pictorial Edition: Prepare for roadside inspections and help improve CMV safety with this must-have CVSA handbook detailing criteria that can prohibit a motor carrier or driver from operating a commercial motor vehicle until the condition is corrected. Includes a full set of CVSA Inspection Schematics. 5. The CSA Handbook – A Complete Guide for CMV Drivers: The only handbook that covers all information CMV interstate truck and bus drivers need to operate successfully under CSA. Provides fingertip access to explanations of the seven BASICs, severity tables, and tips for avoiding the most common violations. Explains how to prepare for roadside inspections, rights during inspection, what not to do, and steps to take after inspection. 6. 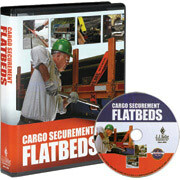 Cargo Securement Handbook For Drivers – with Sliding Calculator This must-have handbook provides need-to-know securement guidelines on the proper use of blocks, ropes, chains, bars and more for flatbeds, dry vans, reefers and other widely used types of trailers to help you properly secure your cargo and maintain compliance. 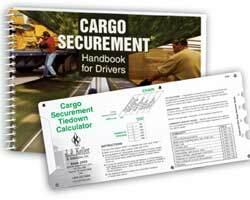 Also features a Cargo Securement Tiedown quick reference. – Frequently asked questions and much more! Helps drivers understand pre-trip and en route responsibilities related to cargo as well as how cargo securement and CSA are related. Covers direct and indirect tie-down methods, restraining capacity of tie-down devices, and how they affect cargo securement. Are your vehicles inspection-ready? And your drivers, too? If not, either or both could be placed out of service. And that can lead to a multitude of negative consequences, including delayed shipments, lost revenue, a tarnished company image, loss of customers, DOT penalties, and a hit to your CSA BASIC scores. Keep your fleet running smoothly with easy access to the same maintenance tested and road-proven heavy-duty aftermarket truck parts that Ryder uses on its own fleet. With over 80 years of experience maintaining the most reliable fleet in America, Ryder knows more about parts than anyone else. This holiday season, enjoy a TPMS discount of 10% (with promo code TST10holiday) on a Truck System Technologies (TST) Tire Pressure Monitoring System (TPMS). Includes all TST products including TPMS systems for trucks and RVs as well as tire pressure sensors for existing systems, and repeaters (to ensure consistent reception on long vehicles) for trucking applications with 10 or more tires or an RV with a trailer. Make your holiday travels safer by having the tire pressure and temperature automatically monitored as your drive. We all know how weather can greatly affect the pressure in your tires – hot temperatures can cause tires to overinflate; cold temperatures can cause them to dangerously deflate. Deflated (or soft) tires force a vehicle to work harder which causes extra wear and tear and reduces fuel economy. Underinflated tires can also affect your Anti-Lock Braking Systems (ABS) or Traction Control Systems (TCS). TST is a leader in truck and RV tire pressure monitoring systems and were awarded the 2015 Reader’s Choice Award by Trailer Life Magazine. Trailer Life covers recreational vehicles, tow vehicles and everything that goes with them. The annual Readers’ Choice Awards honors products that RVers choose as their favorites. To receive your TPMS 10% discount, enter promo code TST10holiday at checkout. Offer good until December 31, 2015. This annual program is part of the Operation Airbrake program and is sponsored by the Commercial Vehicle Safety Alliance (CVSA) in partnership with the U.S. Department of Transportation’s Federal Motor Carrier Safety Administration (FMCSA). The goal is to encourage and improve brake safety on commercial vehicles throughout North America. Of the 13,305 vehicles inspected during last year’s check, 2,162 (16.2%) were placed out of service for brake violations. And, during Roadcheck 2014, brake related violations were the number one cause of vehicles being placed out of service. That’s a lot of vehicles that, before being inspectedand placed out of service, were being driven unsafely on our highways. However, the good news is that even though 16.2% failed in 2014, the other 83.8% passed and were found to have brakes operating and performing as they should. No doubt this is largely due to the efforts of the dedicated drivers, technicians, and fleet managers who consistently make it a priority to keep their brakes inspected and properly maintained. During the week-long brake safety campaign, be prepared for CMV inspectors to conduct brake system inspections (primarily Level IV Inspections) on trucks and buses. Check to ensure your brake-system components have no loose or missing parts, that air or hydraulic fluid is not leaking, and make sure linings, pads, drums or rotors are not worn. Defective or out-of-adjustment brakes will result in the vehicle being placed out of service. Malfunction indicator lamps for Antilock braking systems (ABS) should also be checked to ensure they are in working order. If the ABS is not working correctly, the on-board fault detection system will activate an indicator lamp to alert the driver. If this indicator light is not working, the driver will not be alerted in the event of an ABS problem. A good place to start learning about Brake Safety Week 2015 is this general information page on the CVSA website. how to verify that your ABS is working, identifying chaffed or worn hoses and understanding what a PBBT (Performance Based Brake Tester ) inspection measures. You can also view an example of a PBBT inspection report. ABS: look before they lock – understanding your vehicle’s ABS. This is an informational flyer (in pdf format) you can download and print off. “Would your brakes pass inspection” This article first appeared on the Ryder Fleet Products blog during Brake Safety Week 2014. The tips and advice for preparing brakes for inspection are still applicable to this year. How to Prevent Brake Noise If you’re experiencing brake noise on your truck, this article will help you identify and correct potential problems. Find the parts you need to be prepared. Find anything during your preventative maintenance check that needs attention? Search the truck brake parts section of our website to locate the parts you need to keep driving safely. We carry OEM quality, heavy duty and medium duty truck brake parts from names you know and trust including Bendix, Performance Friction and Phillips Industries. Please share this article with your network of friends to help encourage safe highways. 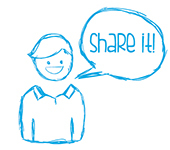 You can use the social media buttons below to share with and help educate your own friends and colleagues. Puzzling to many managers in the motor carrier industry is how a carrier can go from a decent ranking within their peer group one month to one of the poorer rankings within the same group the next month. How can that carrier lose ground even in a month where they had no accidents, only a few roadside inspections, and no serious (meaning out-of-service) violations charged to them? Were all the other carriers in the same peer group perfect during the same month? Time-weighting becomes a huge factor in answering these questions. For example, let’s say our carrier struggles with their performance and scores in three of the seven BASICs: Unsafe Driving, Hours-of-Service, and Vehicle Maintenance. The remaining four ― Driver Fitness, Controlled Substances and Alcohol, Hazardous Materials, and the Crash Indicator ― BASIC scores are low and therefore are not a real concern for the carrier. The Unsafe Driving BASIC covers things like cell phone usage and texting while driving, speeding, not using caution when hazardous conditions exist, following too close, not using seat belts, and not obeying traffic signals. Many drivers struggle with these types of violations and more. Hours-of-Service compliance is all about violations in Part 395 of the regulations. Incomplete logs or failure to log are always the most common. The Vehicle Maintenance BASIC covers simple infractions, many of which could be noticed by a driver who does thorough pre-trip, enroute, and post-trip inspections of the vehicle. Violations concerning lights, tires, brakes, other equipment and accessories, and load securement issues populate this list of safety infractions. So, our carrier may not have had an accident in the last month and did not have an unusual number of roadside inspections, but had been cited for a few violations during these inspections. What did hurt our carrier more than anything is the fact that our carrier received no “clean” inspections while other carriers in our peer group likely did. Anytime a carrier receives a violation, even if the point value is just “1” for the first six months, it feels like getting three of those violations, whereas other members in the peer group with, let’s say, as little as one “clean” inspection can gain as much ground as having three “clean” inspections over other carriers! This is where time-weighting can heavily affect a carrier’s ranking. It also shows the true value of a “clean” roadside inspection. It’s almost like getting three-to-one odds that you will finish above the rest. Bob Rose is an editor in the Transportation Publishing Department of the Editorial Resource Unit at J.J. Keller & Associates, Inc., specializing in motor carrier safety and operations management. Roadcheck is an annual event sponsored by the Commercial Vehicle Safety Alliance (CVSA), North America’s leading commercial vehicle enforcement organization. Within a 3-day period, 10,000 CVSA and FMCSA inspectors conduct roadside inspections at more than 1,500 locations. The goal of this event is to increase safety and security on the highways and reduce the number of crashes involving commercial vehicles. WHEN IS THE 2015 EVENT? The event begins at midnight on June 2 and runs for 72 straight hours — JUNE 2-4. Last year, during Roadcheck 2014, 23% of all the vehicles inspected were placed out of service. Nearly 1 in 4 vehicles! That’s just a sampling of last year’s results. WHAT CAN I DO TO BE PREPARED? To help ensure your vehicles and drivers are prepared to pass a comprehensive inspection, such as Roadcheck 2015, we’ve gathered some of our top educational choices from safety expert J.J. Keller that can help you protect your safety reputation, CSA BASIC scores, and bottom line. The Cargo Securement Handbook for Drivers provides need-to-know securement guidelines on proper use of blocks, ropes, chains, bars, and more for flatbeds, dry vans, reefers and other widely used types of trailers. The CSA Handbook – A Complete Guide for CMV Drivers is the only handbook that covers all information CMV interstate truck and bus drivers need to operate successfully under CSA. Provides fingertip access to explanations of the seven BASICs, severity tables, and tips for avoiding the most common violations. Explains how to prepare for roadside inspections, rights during inspection, what not to do, and steps to take after inspection. Out of Service Criteria Handbook and Pictorial Edition identifies Critical Vehicle Inspection Items following a roadside inspection. Details criteria that can prohibit a motor carrier or operator from driving or operating a commercial motor vehicle for a specified period of time or until the condition is corrected. Includes a full set of CVSA Inspection Schematics. Are your vehicles and drivers ready for Roadcheck 2015? Let us know what your biggest challenges are this year in our comments section below. February 2 (Groundhog Day) is “National Change Your Windshield Wipers Day”. And to help remind drivers that wiper blades are an important safety feature that should be changed every 6-12 months, Ryder Fleet Products is running a “Win Your Blades” contest. Order a pair of Anco Wiper Blades, and you might just win them along with a laptop backpack. Just order between 1/12/2015 and 2/2/2015. Are Your Wipers Showing Signs of Wear? You can quickly and easily check the condition of your wiper blades by running your finger along its’ rubber edge to see if it’s become rigid or chipped. Harsh conditions, such as direct sunlight, can cause the rubber to break down over time and will require that the blades be replaced to ensure a clean, smooth swipe. You may also notice a cloudy film on your windshield (which is caused by dirt, oil or grime accumulation), or that the rubber appears to have pulled away from the wiper frame. All signs that it’s time to replace your wiper blades. Which Wiper Blade Should You Choose? Ryder Fleet Products offers a wide selection of quality wiper blades from ANCO including The Contour beam blade, The Profile beam blade, The Transform hybrid blade, AeroVantage conventional blade, The 31-series, and Winter specialty blades. And, ANCO understands the importance of Original Equipment fit, so you can rest assured your new wipers will fit and function as seamlessly as your previous ones – no matter which type of wiper blade you choose. Below, we have put together a quick guide to get you familiar with the different ANCO blade options featured on our website. 1) Anco Contour Blades – a beam blade providing premium all season performance. Beam blades have an infinite amount of pressure points which provide better blade-to-windshield contact and are more aerodynamic – helping prevent lift and noise. Beam blades also have less moving parts and no superstructure so ice and snow don’t stick to them. The Contour blade has an exclusive, advanced rubber compound that gives you a streak-free wipe time after time. 2) Anco Profile Blades – a beam blade with advanced technology for every vehicle. Like the Contour, the Profile is also a Beam blade with an infinite amount of pressure points for better blade-to-windshield contact. Beam blades are more aerodynamic than conventional blades which helps prevent lift and noise. They also have less moving parts and no superstructure which means ice and snow don’t stick to them. The Profile blade has a unique connection system that offers an ultra-low-profile design that mirrors the look of original equipment beam blades. 3) Anco Transform Hybrid Blades – The new look of performance. This blade integrates the aerodynamic features of a beam style wiper with the evenly distributed pressure points of a conventional structure. The Transform is a replacement blade for vehicles that came equipped with hybrid technology or an upgrade for vehicles that utilize a J hook design. 4) Anco AeroVantage Conventional Blades – Clear wipe at any speed. Replaces OE with a quality that matches the style, fit and performance of the blade that originally came with the vehicle. Has an aerodynamic vented bridge that maintains wipe at highway speeds. Affordable wiper blades that replace OE with a quality that matches the style, fit and performance of the blade that originally came with the vehicle. Uses exclusive designs and materials to ensure clear windshields and safe visibility in any driving condition. The specialty blade is more durable for winter conditions and contains an exclusive extra thick rubber compound that provides a consistent, streak-free wipe while remaining flexible in even the coldest temperatures. A rugged rubber cover over the heavy duty frame prevents slush from freezing joints. If you need to determine which wipers will fit your vehicle, go to the Anco application guide and enter your vehicle’s year, make & model. Then type in the part # that comes up into the search bar on Ryder Fleet Products. Or contact our customer service at 855.885.5631 or FleetProductsInfo@Ryder.com. And remember, as part of our “Win Your Blades contest, if you order your Anco Wiper Blades between 1/12/2015 & 2/2/2015, you could get them for free – along with a laptop backpack*! “For price of this product it is worth every penny, because I’ve used it on my vehicle along with a different brand and I really see and hear the difference. It is much quieter and last longer. Ryder Fleet Products provides a wide range of truck parts, shop supplies & safety items for the medium and heavy duty truck industry at prices much lower than retail. And we offer FREE shipping for orders over $250. Find a part number, cross reference a part, or ask a question by contacting our customer service team at 855.885.5631 or FleetProductsInfo@Ryder.com. -Wiper blades must be purchased from January 12, 2015 – February 2, 2015 from RyderFleetProducts.com. – The winner will be credited for the amount of one pair of wiper blades. If only one blade is purchased, the winner will be credited for the price of that blade. – You may purchase as many windshield wiper blades as you wish; however, credit will only be applied for one pair. The OSHA standard for The Control of Hazardous Energy (Lockout/Tagout), 29 CFR 1910.147, addresses practices and procedures for disabling machinery or equipment to prevent the release of hazardous energy while employees perform service and maintenance activities. It also outlines program development and training for those employees. If your employees service or maintain machines where the unexpected startup, energization, or release of stored energy could cause injury, the standard likely applies to your company. Examples of common general industry sectors that must comply include manufacturing, food, wholesale/retail, healthcare, hospitality, and entertainment. Exceptions include agriculture, construction, and maritime industries, as well as oil & gas well drilling and servicing. Employees servicing or maintaining machines or equipment may be exposed to serious physical harm or death if hazardous energy is not properly controlled. According to OSHA, compliance with the lockout/tagout standard prevents an estimated 60,000 injuries and 122 fatalities each year. Yet it was the eighth most frequently cited OSHA violation in 2013, often leading to substantial fines. Develop, document, implement and enforce the use of lockout/tagout procedures. Check that new or overhauled equipment is capable of being locked out. Ensure that lockout/tagout devices are durable, standardized, substantial, and used only for lockout/tagout purposes. Establish an energy control program made up of lockout/tagout procedures, periodic inspections, and training. WHAT MUST EMPLOYEES BE TRAINED ON? Employees must be trained on at least three areas: aspects of the employer’s energy control program, elements of the energy control procedures relevant to their duties or assignment, and various requirements of the lockout/tagout standard. HOW CAN J. J. KELLER HELP? J.J. Keller offers access to the complete range of information, training, and supplies to help you build a first-class lockout/tagout program, all backed by their team of in-house experts. Comply with requirements and train employees with The Lockout/Tagout training program. Available on DVD. Additional lockout/tagout items to help you comply with requirements and help keep your employees safe are available online at Ryder Fleet Products. Thank you to J.J. Keller for this guest blog article on developing your safety and compliance program for lockout/tagout compliance. With over 60,000 parts in inventory from over 400 suppliers, we’ll help you find just what you’re looking for. As winter draws near, lots of us start looking out for deals on items like Christmas sweaters, winter coats, and maybe a snow sled. However, if you’re an owner operator, fleet manager, or just do a lot of winter driving, chances are you’ve got ice scrapers, winter wiper blades and heated mirrors on your list as you begin to prepare for the wintry days ahead on the road. At Ryder Fleet Products, we can help you and your fleet get ready for the blustery, cold days of winter driving conditions and have put together the following checklist for you as you begin to winterize your truck and settle down for a long winter’s drive. Remove snow, ice and frost from your windshield with an ice scraper or use a snow brush to help remove accumulated snow. One of the easiest things you can do to prepare for winter driving is to replace your current wipers with those especially designed for winter conditions. Winter wipers are thicker, more flexible, and can remove heavy rain, sleet and snow better than regular blades. A good winter wiper blade usually consists of a rugged rubber cover over a heavy duty frame to prevent slush from freezing joints. Have a de-icer on hand such as CRC’s Ice Off to melt snow, ice and frost on contact from your windows. This de-icer works in sub-zero temperatures and will not harm a vehicle’s finish. Tip: Also useful for thawing frozen locks. A coolant tester, such as this refractometer from Fleetguard Cummins provides a fast and easy way to determine the freeze point protection in both Ethylene Glycol and Propylene Glycol coolants. It is more accurate than test strips or float-type hydrometers and is as easy as 1,2,3. Cold weather can lower tire pressure and cause your tires to become under inflated. Not only can this lead to increased tire wear and lower gas mileage, but it also presents the risk of a blow out. Check out these tire pressure monitoring systems for trucks from TST – the leader in tire pressure and temperature monitoring equipment. Tip: A tire pressure monitoring system also protects you during the summer months when tires are prone to becoming over inflated. For more info on tire pressure and the effect it can have on your tires as well as your vehicle, read Have Peace of Mind on the Road with a Tire Pressure Monitoring System. or Benefits of Checking Tire Pressure Regularly. Ryder Fleet Products carries a wide range of gloves including kevlar, leather, latex, neoprene, and pvc gloves. For winter weather purposes, though, here are two of our favorites. These insulated gloves are often used in Refrigerated Areas, Utilities, Food Processing, Commercial Fishing, Construction, Outdoor Winter Activities and Recreation. We like them for their excellent thermal insulation and extra softness. Tip: Most of our gloves are available in several sizes – be sure to look for the correct size when placing your order. Mirror mirror on the wall, who’s the foggiest of them all? Keep fog and ice off side view mirrors and spot other vehicles easier with a heated mirror. You’ll find trusted names in vehicle mirrors at Ryder Fleet Products. Shop from well known brands such as Velvac, Grote, Retrac and Mirror Lite. Tip: A lot of the mirrors look similar so be sure to check the part number to make sure it will fit your particular vehicle. This Extreme Weather DVD from JJ Keller offers sound advice for handling a variety of potentially deadly conditions. Covers techniques for driving in snow, ice, rain, fog, heavy winds, and more. Would Your Brakes Pass Inspection? Out-of-adjustment brakes and other brake system violations make up almost half of the out-of-service roadside inspection violations on commercial vehicles. From September 7-13 – Brake Safety Week – more than 30,000 brake inspections are expected to be conducted. Roadside inspectors will be inspecting brake-system components to identify loose and missing parts; air and hydraulic fluid leaks; worn linings, pads, drums and rotors; and other faulty brake-system components. Antilock braking systems (ABS) malfunction indicator lamps will also be checked. If you find something during your preventative maintenance check that needs attention, search the truck brake parts section of our website to locate the parts you need to keep driving safely and receive the thumbs up from the roadside inspector. Training should also involve teaching drivers how to conduct a “system check” that includes a leak check, a check of the low-air warning device, a test of the emergency brakes, a check of the compressor build-up rate, a check of the parking brakes, and a rolling check of the service brakes. 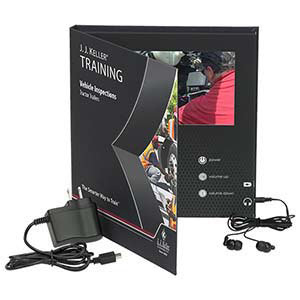 An online interactive training course, such as one of these offered by JJ Keller, can be a valuable tool for understanding standard procedures for inspecting a vehicle. The courses feature the latest technology and interactive learning techniques and combine the power and reliability of JJ Keller’s training programs with the convenience and cost-effectiveness of online training. If maintenance experts are inspecting the brakes during all preventive maintenance checks and drivers are doing a good job with their daily inspections, the brake system should pass inspection – whether it’s Brake Safety Week or at any other time! Visit the brakes section of our website to find OEM quality heavy duty and medium duty truck brake parts. You’ll find the brand names you can trust such as Bendix, Performance Friction and Phillips Industries. Betty Weiland, Sr. Transport Editor at J. J. Keller & Associates, Inc.
How Truck Fleets are Working to Halt the Spotted Lanternfly Invasion. DOT Hours of Service: Understanding the Unique Compliance Requirements.